With a dish the size of 30 football fields, China's new FAST radio telescope, which measures 500 meters in diameter, dwarfs Puerto Rico's 300-meter Arecibo Observatory. Having the world's largest and most powerful new radio telescope, the Five-hundred-meter Aperture Spherical Telescope (FAST), "We can receive weaker and more distant radio messages," said Wu Xiangping, director-general of the Chinese Astronomical Society, "It will help us to search for intelligent life outside of the galaxy and explore the origins of the universe," he added underscoring the China's race to be the first nation to discover the existence of an advanced alien civilization. The dish will have a perimeter of about 1.6 kilometers, Xinhua News said, and there are no towns within five kilometers, giving it ideal surroundings to listen for signals from space. According to chief scientist from China’s National Astronomical Observations, Li Di, FAST will be able to scan up to twice more areas of the sky than Arecibo shown above, and it will have between three to five times the sensitivity. It’s in their hopes that if there is indeed alien life, this gargantuan will find it. The candidate must have at least 20 years’ previous experience. He or she must have taken a leading role in large-scale radio telescope project and have plenty of managerial experience as well as holding a professorship – or equally senior position – in a world-leading research institute or university. “These requirements are very high. It puts most astronomers out of the race. I may be able to count those qualified with my fingers,” said Wang, who was director of the academy’s laboratory of galaxy cosmology but is not involved in Fast’s management. Foreign astronomers of non-Chinese origin may face additional difficulties, he added. 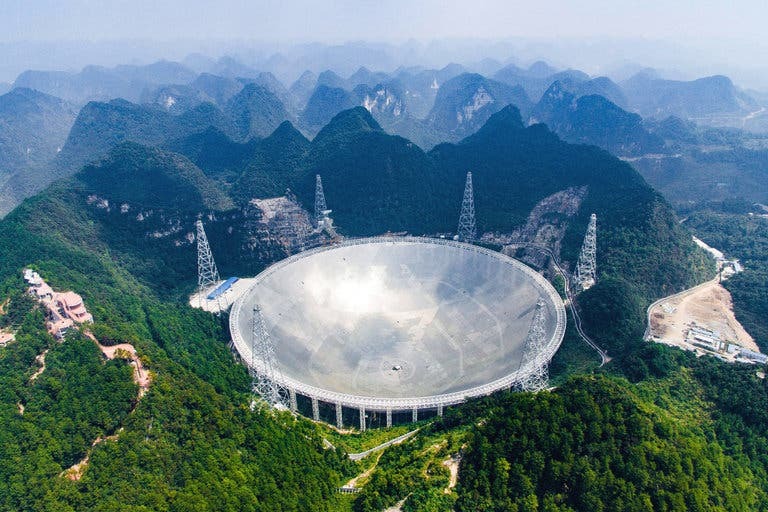 Some Western researchers have plenty of experience running giant telescopes, but their expertise might not work in China due to language barriers and cultural difference. Guanxi, or interpersonal relationships, could affect decisions such as the scheduling of observation slots. “The fight to decide who gets observation time and who doesn’t can turn the job into a walk on thin ice,” Wang said. The challenging nature of the work might require the chief operator to work long and irregular hours and give up his or her own research. The job will also involve living and working in one of China’s least developed areas, which might cause discomfort and inconvenience to their family. “It is not a job for a scientist. It’s for a superhero,” Wang said. China Building World's Largest Radio Telescope–"Will Search for Intelligent Life Outside of Milky Way"